Written by Felipe Azenha & filed in Development Pipeline, Market Watch, Mixed-Use, Transit, Urbanism. South Florida, comprised of Broward, Miami-Dade, and Palm Beach Counties, is the fifth largest urbanized area in the United States with more than five million residents. Within the next 20 years, South Florida’s population is expected to grow to nearly eight million people. As one of the fastest growing regions in the nation, South Florida faces the challenge of how to maintain the region’s economic competitiveness. A multimodal transportation system that provides mobility for existing and future residents and visitors is key to the region’s economic vitality and quality of life. South Florida needs a regional transportation system now more than ever that connects the Central Business Districts along the South Florida Coast. Last month Brightline, the only privately owned, operated, and maintained passenger rail system, launched express service connecting Fort Lauderdale and West Palm Beach along the FEC corridor. Florida East Coast Industries, (FECI) the parent company of All Aboard Florida, which operates the Brightline, has successful operations in real estate, transportation, and infrastructure. They also happen to own 351 miles of mainline track (right of way) from Miami to Jacksonville. 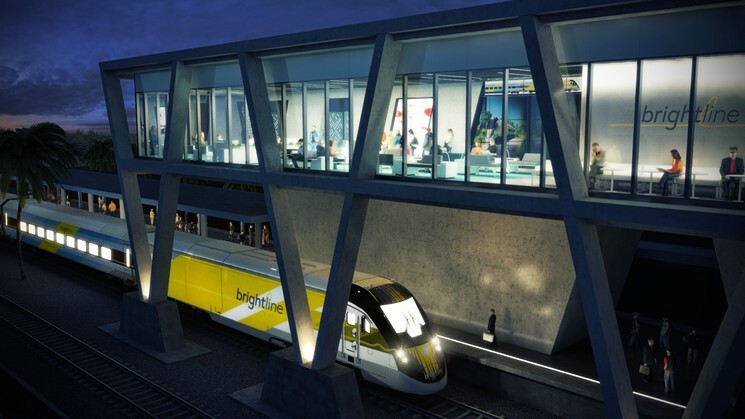 Brightline service will extend to downtown Miami upon completion of Miami Central Station and there is also future service planned to Orlando. 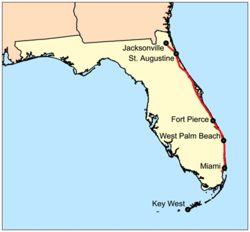 FECI owns 351 miles of mainline track (right of way) from Miami to Jacksonville. The Brightline will hopefully become a public transit catalyst for South Florida. Once Miami Central Station opens, you’ll be able to hop on a train in downtown Miami and arrive in West Palm Beach within 60-minutes – all while sitting in comfortable seats and being productive with onboard wifi. There are even food and beverage options. Forget about sitting in traffic on I-95 for 75+ minutes. If you’re commuting between Miami and West Palm Beach, the Brightline just became a great option if you can afford it. This is a huge first step, but the reality is that the Brightline is probably out of reach for many people. A round-trip ticket between Fort Lauderdale and West Palm Beach is $30. The real game changer would be the expansion of the Tri-Rail Coastal Link using FECI’s right-of-way. The South Florida Regional Transportation Authority (SFRTA) and the Florida Department of Transportation (FDOT) along with Miami-Dade, Broward and Palm Beach Metropolitan Planning Organizations (MPOs), the Southeast Florida Transportation Council (SEFTC), and South Florida and Treasure Coast Regional Planning Councils are working towards this goal. Unfortunately, this cannot happen soon enough for South Florida, at least using traditional urban planning and design tools. Transit Oriented Development (TOD); what is it, and how does it relate to zoning? 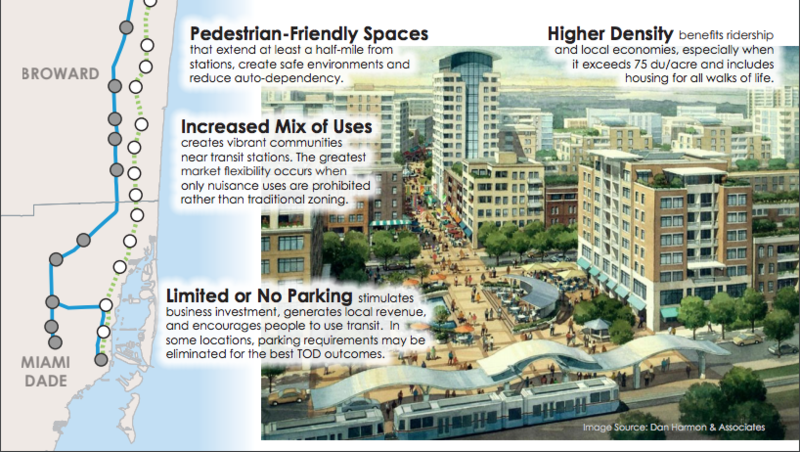 Urban planning professionals define TOD as the proper and sustainable mixture of residential and non-residential uses within walking distance of a major public transportation station. Of course, applications and intensity of methods are managed by zoning. So what’s so difficult about that concept? The definition of “proper and sustainable mixture of uses,” because there is no magic formula or secret recipe for that. The appropriate mixture in Miami will be different than in Delray Beach and different than Jupiter. Actually, it’s pretty safe to say that every TOD station will be different if they are expected to perform and be successful. The correct mixture and intensity of uses must be carefully selected based on each location’s history, density, culture, style, and environment. The SFRTA is proposing 28 new station locations in the tri-county area. The SFRTA is proposing 28 new station locations in the tri-county area along the FECI corridor. New transit service would have a dramatic impact as to how real estate developers plan their next big project if municipalities with proposed new stations can get their act together when it comes to zoning. The SFRTA has a “suggested” Transit Oriented Development Policy that they are introducing to all 19 municipalities with proposed stations. For South Florida to have a truly successful transportation system, it is dependent upon having the correct zoning in place around all 28 proposed stations. Without the proper zoning, the Tri-Rail Coastal Link will likely not achieve its full potential and will flail. We must get zoning right to achieve the desired ridership numbers to help defray operating and maintenance costs. The rule of thumb amongst urban and transportation planners of 75 dwelling units per acre has been the accepted minimum density standard within a TOD shed (1/4-1/2 mile radius from the transit station). However, there are other factors such as FLR (floor the land ratio), minimum parking requirements, minimum lot size, setbacks, height limitations, minimum unit size, etc. that often limit achieving 75 d.u./acre. Furthermore, 75 d.u./acre should not be achieved within a single zoning category, it should be delivered to all zones within the radius of the transit station. This last part is one of the most common misconceptions about TOD, as is often believed to be a cluster of high, dense buildings. The ideal TOD should have a gradual transition from the “un-affected” zones to the TOD zones, and also within the TOD. This typical implementation has its challenges; like how to visualize those transitions, how to accurately and efficiently calculate if the overall goal of density is achieved across multiple zones and property sizes. 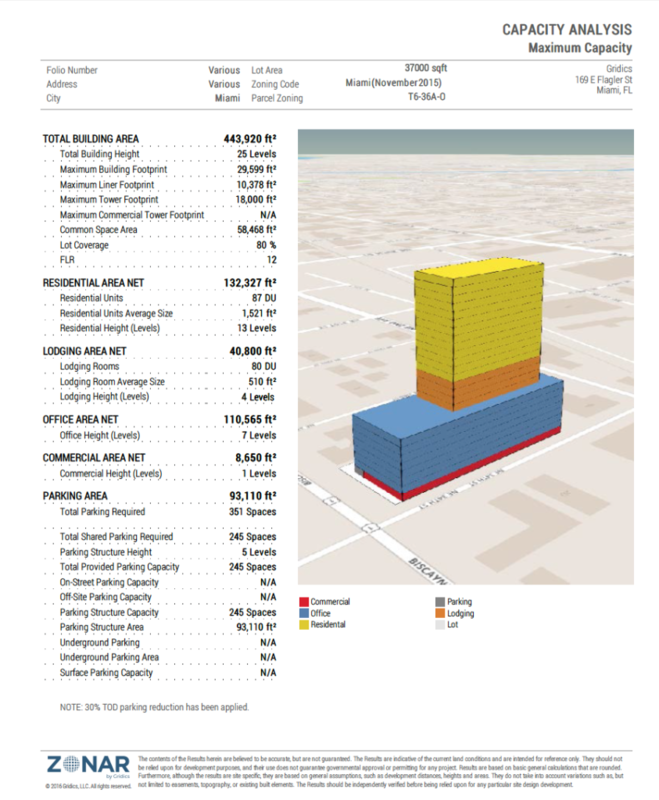 South Florida Regional Transportation Authority’s TOD zoning recommendations. The company I co-founded, Gridics, has developed zoning software that will help cities make data-driven decisions based on their current or proposed zoning code. Zonar.City can help municipalities better understand the true impact zoning regulations will have on development. These are just a few of Zonar.City’s features that are helping cities make better data-driven planning decisions. Zonar.City also gives planners the ability to “clone” their zoning code and make changes to the zoning code, in their own environment, in order to hypothetically test how changes to the zoning code would affect development, infrastructure demands and the future needs of the city. Since going to market with Zonar.City in July 2017 a few progressive cities in South Florida have already partnered with Gridics. The City of Miami, City of Fort Lauderdale and the City of Delray Beach have all taken the initiative to digitize their zoning codes. Zonar.City is a tool to help cities make better planning decisions. In addition, the software is helping cities make internal processes more efficient, while also providing greater transparency to the public when it comes to the complicated and foggy world of zoning. Zonar.City allows real estate professionals to quickly analyze the development potential of a parcel or an assemblage with a few clicks. I sincerely hope that the cities along the Tri-Rail Coastal Link can get their zoning right, if they don’t the Tri-Rail Coastal link will have a tough time surviving. It will take a team effort to make the Tri-Rail Coastal Link a success. Let’s make it happen South Florida! Want to get involved? Share this article for us through social media using these buttons and let’s spread awareness!